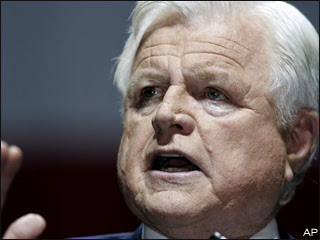 Senator Ted Kennedy was admitted to a Boston hospital after suffering a seizure at the family compound in Hyannis Port. Love him or hate him, agree or disagree, he has been a real force in American politics. He entered the Senate in 1962 which I believe makes him the second longest tenure in that body behind Senator Byrd. Over the years I've certainly disagreed with him more often than not, but now on some issues I find myself siding with him. This I'm told is a variant of what is the typical American male in that as they grow older they become more conservative. On a fiscal basis, I fit that demographic, but on a social basis, I don't. This is due to the high jacking of the conservative movement by the neocons, and the corporatist among them that has the most to do with my philosophical metamorphosis. You cannot run the world for the benefit of a few to the detriment of the many. This is the rocky ground where the seeds of anarchy and revolution are sown and like the noble old vineyard or olive orchard, thrive on adversity and grow and bear the fruit to which all others aspire. This is well documented in history, and indeed our American revolution had its seeds sown on the same rocky ground. We have deviated from the standard of democracy where it was "one for all, and all for one" to all for one and one for one. It breaks the prototypical mold of democracy, and will have very dire consequences on American societal fabric, and it is coming in the future. I can't say if it is near term or long term, but unless we change and radically so, it will fall on us. While we are strong, we are not Euclid. There are no shortages of rocks, indeed boulders today. It resembles the Catalonia Boulder Fields half way down the Baja on the only road to Cabo San Lucas. Huge boulders without a right angle, or for that matter any other angle except where they were blasted for the road. I did figure out the reason for the geologic phenomena, it was where God lost his marbles. Our boulder field contains many huge stones, health care hand in hand with medicare and social security exacerbated by illegal im- migration, a growing boulder of national debt of which may well take generations to retire even if we were able to start on it today. Then there is our foreign policy that is another huge boulder, and like it or not has led to a huge diminution of our stature in the world among friend and foe alike, and recent foreign trips have underlined this fact when you speak with its citizens. Sounds pretty dire, but certainly not hopeless. Over the years I have found that the smartest people I know and have had the pleasure of working with or for had one trait in common. They had the ability to take huge problems and break them down in the smallest component parts that could then be successfully dealt with. That is what is needed now. Someone with the ability and the tools to blast these huge boulders in to small rocks and then with the fertilizer of innovation, the organic matter of imagination, and the water of foresight and diversity, to say nothing of the sunshine of understanding, break these down to fertile soil so instead of having a growing wasteland, we have a lush fertile garden. It is beyond my comprehension how this can be done by someone who constantly has their eye on the rear view mirror by maintaining the status quo of past policies many of which while being implemented with the best intention have fallen way short of expectations or what the country really needs. Only when people start thinking from this type of perspective will we see any improvement which we really need. Well said, Sir Richard! It is time for the silent majority to speak their minds and the moderates of this world regain their rightful place in our politics. Hey how did such a bright erudute fella get into the KMSA?? American foreign Policy...you mean there is one? Yep..looks like the ol' spam head is gunning for a reunion with Mary Jo K.
Keep it up Knights... The KMSA blog continues to be the most enteratining and informative around. Well, politicians certainly have enough of the "fertilizer." Unfortunately, they use too much of it to raise funds and appeal for votes. We'll see if this cycle of change is any better. In the meantime, I'll continue to try to change myself, one small rock at a time!